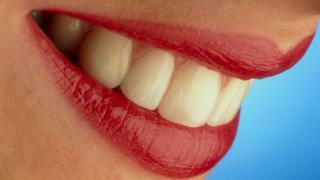 How dangerous is teeth whitening? Some beauty salons are continuing to provide illegal teeth whitening despite being prosecuted by regulators, an investigation by 5 Live Investigates has found. Undercover reporters were offered treatment by one therapist who had been fined thousands of pounds just months earlier. The General Dental Council has already prosecuted 24 people this year - more than the whole of last year. But with the popularity of teeth whitening soaring, who is allowed to do it and what are the dangers if you are treated by someone who isn't properly qualified? Celebrity culture and reality shows such as The Only Way is Essex have made teeth whitening one of the most popular cosmetic treatments in the UK. According to Mintel research, more than a third of adults are considering having it done. It involves bleaching your teeth using a whitening product usually containing hydrogen peroxide. The British Dental Association (BDA) says whitening is perfectly safe if carried out by a registered dental professional. But the BDA warns anyone else won't have the right training or knowledge and could cause permanent damage to your teeth and gums. For example, if the mouthguard containing the bleaching gel does not fit properly some of it may leak and cause painful chemical burns. In extreme cases, people have been sick after swallowing the bleaching product. The BDA says beauticians aren't properly trained to take a medical history to make sure someone is suitable for teeth whitening. Who's allowed to do it? Under the Dentists Act 1984, it's illegal for anyone other than dentists or dental health professionals such as hygienists to carry out teeth whitening. But we found dozens of beauty therapists across the UK offering the treatment. Media captionWatch beauty therapist Janet Johnstone attempt to get round the law banning her from offering teeth-whitening services. One of those is Janet Johnstone who operates out of a salon called Simply Chic in Walkden, Greater Manchester. In January, this year she was ordered to pay £4,450 in fines and costs by magistrates after being found guilty of unlawfully "holding herself out as being prepared to practice dentistry" - namely teeth whitening. But when I visited the salon last month, she was still offering the procedure for £50. She asked me to fill out a basic medical questionnaire and explained how the treatment would work. "You have a gum shield in for 13 minutes and you jiggle it around," she said. "Then you stop it and jiggle it around again in your mouth, press start again, and do it for another 13 minutes." Mrs Johnstone told me I would have to do the treatment myself in the salon, but she would be close by. "I don't actually do it. I'm here with you. Well, I am around it." She did say if I was unhappy about going ahead I should contact my doctor or dentist. The General Dental Council (GDC) is adamant that people cannot get round the law by handing customers the equipment to do the treatment themselves. The GDC said: "The Dentists Act makes it illegal for anyone who is not a dentist to give 'treatment, advice or attendance' that would usually be given by a dentist. "Handing an individual a tooth-whitening tray and advising them on application, amongst other things, could constitute the giving of 'advice or attendance' and would be illegal." We also showed our undercover footage to Dr Nigel Carter, chief executive of the British Dental Health Foundation. While he said he could not comment on individual cases, he told us: "It is concerning to hear that any beautician would provide tooth whitening through a self-prescribed system, take a medical history and provide instructions on how to place the trays and the light. "A defence of merely offering hire of the treatment room in which a patient can carry out their 'at-home' whitening is an inadequate one. In this case, from the footage we have seen, this was certainly not made clear to the reporters, the implication was that the company in question was providing the treatment. "Assuming that she is neither medically or dentally trained, we would question her ability to take and interpret a medical history." Mrs Johnstone told 5 Live Investigates: "Simply Chic offers teeth-whitening kits to be purchased at £50 just like High Street chemists and offers the hire of a treatment room. This is also being done right around the UK by High Street companies. A list of instructions informs the client what to do." She said her teeth-whitening kits did not contain any hydrogen peroxide and could be used by anyone without the supervision of a dentist. So why are home kits allowed and are they safe? The British Dental Association says the products you can buy online or from High Street shops often fail to declare the precise chemicals used so it is very difficult to assess their safety. 5 Live Investigates was able to buy a teeth-whitening kit from an online retailer in the UK which contained sodium perborate. This chemical is banned for use in cosmetic products by the EU which says it can cause infertility and foetal abnormalities. What's the punishment for illegal teeth whitening? Prosecutions against people who carry out illegal teeth whitening are brought by the General Dental Council. Anyone caught before 12 March this year faced a maximum fine of £5,000, but now the fine is unlimited. They may also be ordered to pay other costs including compensation to any victims. But the BDA feels the courts need to be tougher. It says fines should reflect the profits made and persistent offenders should face imprisonment. "Some of the fines imposed by the courts are derisory - a few hundred pounds," the BDA told the BBC, "which is doing nothing to stamp out unsafe and illegal tooth whitening. If profits are higher than risks, there is no effective deterrent." BBC 5 Live Investigates is broadcast on BBC 5 Live on Sunday 20 September at 11:00 BST.